There is a war on in Ukraine – and, moreover, it’s a pilot project for a new kind of war. History books we’ve read or lessons learned in school have given us a fixed image of what war is: the opposing sides send their tank brigades in to fight, soldiers sit in trenches and then, yelling ‘Hurrah!’, rush at each other. That’s the kind of war we’re used to. Modern wars like those in Afghanistan or Iraq are predicated on the use of the latest precision weapons, the human factor is reduced to a minimum and technology does most of the work. In Ukraine we do war differently. 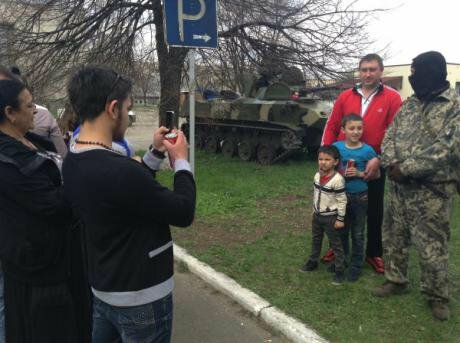 A Slovyansk family poses with what Russian state media are universally calling a 'supporter of federalisation.' (c) RIA NovostiRussia has not formally declared war on Ukraine. There was no official ultimatum (though Russian ambassador Mikhail Zurabov was recalled ‘for consultations’), nor any notification of neutral countries, as laid down by the Hague Convention. This is an exact description of current events in Eastern Ukraine. During the last fortnight, several cities, whose names were familiar to most Ukrainians though they had little idea where exactly they were, have witnessed mass occupation of their government buildings. 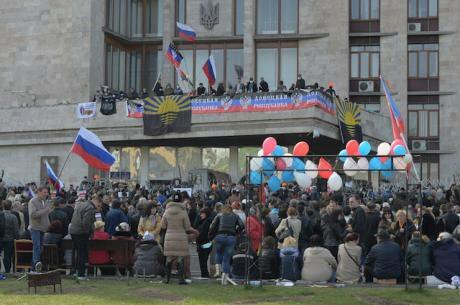 In Kramatorsk, Horlivka, Mariupol and Slovyansk buildings were seized in accordance with a previously agreed plan: first there was a demonstration, with groups of ‘outraged’ citizens demanding a local referendum, then local inhabitants supported by ‘little green men’ occupied police stations and security service buildings. The explanation was very simple – this is where arms are kept. 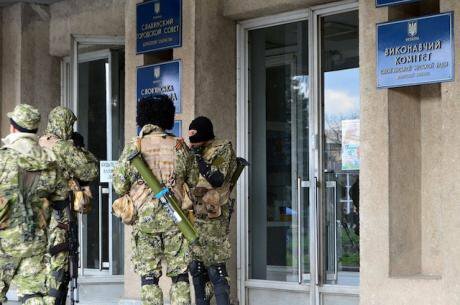 When the separatists had armed themselves and, probably, ensured the support of local siloviki (security services, police and armed forces) along the way, they took control of the local authority offices, city or village. The flag of the unlawful and self-declared People’s Republic of Donetsk would then be raised. Anti-Kyiv protesters outside Donetsk's town hall. Administrative buildings throughout the east have been seized. CC Andrew ButkoIt goes without saying that no one in Kyiv has any intention of recognising the People’s Republic of Donetsk. Moreover, the Ukrainian government is convinced that Russia is behind the separatists and that their demands all emanate from Moscow (once more ‘backing up the civilians’), rather than from the people of the Donetsk oblast. The Ukrainian Security Service has said that it has never caught so many Russian agents, and the common factor uniting them all is that they are professional spies. On 17 April, for example, Marina Ostapenko, press secretary for the Ukrainian Security Service, announced that officers had detained Sergei Rzhavsky, a member of a subversive group acting on orders from the Chief Intelligence Department of the General Staff of the Armed Forces of the Russian Federation in Slovyansk. According to Ostapenko, Sergei Rzhavsky was directly involved in mass disturbances in Donetsk, had carried out violent attacks, pogroms, and offered armed resistance to law enforcement officers. This agent’s mission was to have been the organisation of mass disturbances in the town of Volnovakha (Donetsk oblast), with particular emphasis on seizing and occupying the town headquarters of the Ukrainian Interior Ministry. The Ukrainian government will not recognise the People’s Repulic of Donetsk, but is prepared to start talks about extending the autonomy of the regions. It will also pass a law on local referendums, which would permit the burning questions of today to be decided inside the community itself, rather than from Kyiv. But the government is not intending to embark on out and out federalism. The assumption in the capital is that if the regions are granted the right to self-determination, Russia will do all it can, whatever the cost, to make them part of the territory of the Russian Federation. Kyiv will have to agree to talks, because it has shown little ability for military action. This was clear from the 'anti-terrorist operation', which went into operation in Ukraine during the week of 14 April. The authorities have admitted that the police and the soldiers were not morally resilient enough to conquer their fears or to resist the temptation to respond to provocation. The most obvious example of these failings was in Kramatorsk, when Ukraine’s 25th Non-Divisional Airborne Brigade went over to the separatists. But they didn’t only switch sides, they also handed over their personal weapons and six armoured personnel carriers. ‘The 25th Airborne Brigade, which displayed such cowardice and handed over their weapons, will be disbanded and those found guilty will answer for their cowardice before a court,’ commented Acting President Oleksandr Turchynov. The authorities in Kyiv are prepared to declare an amnesty for those people who seized buildings, abandoning any intention of sending them to prison. But on one condition only – that they hand themselves in and lay down their weapons. The People’s Republic of Donetsk has so far been unwilling to take this step.